By Sue Chan - New Zealand - 24 Jun/03 - Viewed 1793 times. After settling in we drove about five minutes into Queenstown to take a ride on the Skyline Gondola. With directions from the receptionist we had little trouble finding it and managed to get a parking space. The cableway was opened in 1967 and the ride to the top takes just four minutes although it rises 450m up a steep hillside. 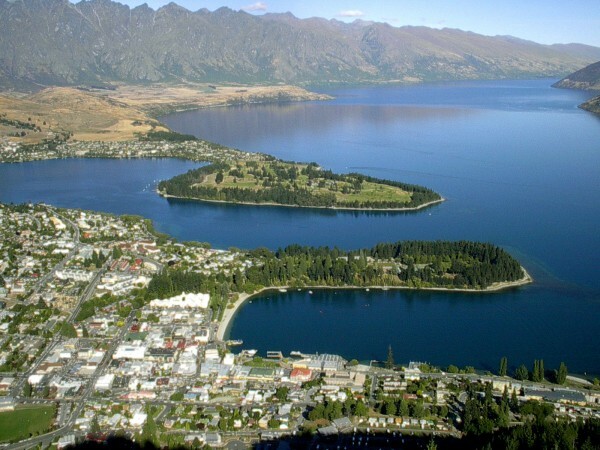 From the viewing platform at the top there are views over Queenstown, Lake Wakatipu and the Remarkables range. We watched a New Zealand video, saw para-gliders, bungy jumpers and luge riders and then returned to town. Queenstown has a population of around16.000 and is one of the main destinations for tourists with skiing in the winter and many walking tracks for summer, and although it was a bit busy we were able to park near the Mall. We went to the Visitors Centre to book a cruise for the next day then walked through the Mall, past historic buildings to Church Street, also traffic free, and continued around the waterfront. After driving some distance along Lake Esplanade we returned to our Motel about 7pm. Next morning, from the window of our room, we were treated to a spectacular sunrise over the Lake and the Remarkables. We left by 8.30 as we had been advised to arrive early and park in a residential street, as long-term parking is a bit difficult. We had no problem with this and it was not too far to walk into town, past the entrance to the gardens and around the water to the mall. Of course we were a little early for our 10am cruise, so we looked around the shops, and put two films in to be developed before again walking along the waterfront. The T.S.S.Earnslaw a vintage steamship, named after Mt. Earnslaw the highest peak in the region, makes around 2000 trips a year carrying tourists across Lake Wakatipu to Walter Peak Farm. Built in Dunedin, the ship was dismantled and taken by rail to Kingston where it was reassembled and launched on Lake Wakatipu in 1912 to service the remote farming communities. It was capable of carrying 1500 sheep and 30 cattle on the decks. It is now the only surviving vessel of a fleet of steamers and the last coal-fired passenger-carrying vessel still operating in the Southern Hemisphere. Fiordland Travel purchased the steamship from New Zealand Railways and after a complete refit began operating her as a tourist venture in 1969. Walter Peak Farm was founded in the 1860s and is one of the oldest sheep and cattle stations in the country. In 1981 162 hectares were divided off to become Walter Peak High Country Farm. Fiordland Travel took over the lease in 1991 developing excursions for visitors interested in the high country farming lifestyle. At the Steamer Wharf was a coal truck waiting to load coal into the ship as she burns a tonne of coal an hour. The cruise across the lake was very enjoyable although the weather was overcast and quite cold. We were glad we hadn�t taken the B.B.Q. option, as it would have been a bit unpleasant on a day like that. We arrived back in Queenstown at 11.45 and went to collect our photos. They were quite good but at almost $40 for two rolls they would need to be!! By now we knew our way around and returned without any problems to Frankston, where we had been staying, past the motel and on to the roundabout where we turned south. The weather had cleared and this was a very pretty drive between the lake and the Remarkables. At Kingston the �Flyer� was at the station and after we had looked at it we had lunch at the station caf� then took our drink to a table near the lake. This is the southern end of Lake Wakatipu and very picturesque. The train did not leave for half an hour and would not return until 3pm, which made it too late for us to take a ride. We then travelled through almost flat farming country, which continued for most of the 160km to Te Anau, which we thought was an attractive little town. We stopped in the main street, put in another film to be developed � checking the price first � and got a town map and directions to the Explorer Motor Inn where we had a booking. Here our room was very large with a separate kitchen and bathroom and sliding doors opening onto the lawn. The owner (Margaret) was very nice and helpful and booked us on a tour of the Glow-Worm Caves that evening. We walked from our room across a park, down Milford Road, the main street, then along Lakefront Drive before boarding the Moturau at 6.45pm for a 35min trip across Lake Te Anau. Lake Te Anau is the largest lake in the South Island covering an area of 34sq km. The caves, discovered in 1948, are on the western shore at the base of the Murchison Mountains. The Tunnel Burn Stream flows through them and continues to wear away the rock. Inside is a series of walkways � not always easy � and two short trips on a punt, which took us past thundering waterfalls and whirlpools into the still of the glow-worm grotto. These punts are operated by the guide who glides them along by pulling on chains fastened to the ceiling. I don�t think I liked the whole experience much. The tour took much longer than expected and it was almost 9.30 when we returned to Te Anau. We were fortunate to have a kitchen in our room where we could make something to eat. Next morning we left at 9.30 to travel to Milford Sound. Our reasoning for this departure time was the morning coach tours would have gone and it was too early for them to be returning � it worked. We saw little traffic even though this is one of the most visited areas in New Zealand. Following the shore of Lake Te Anau we came to Te Anau Downs, the starting point for the Milford Track, where the boat was waiting to take walkers across the lake. A little further on is Eglinton Valley in the Fiordland National Park. Near here a boardwalk leads around the Mirror Lakes where images of the surrounding mountains are reflected in the still water. We drove through �the avenue of the disappearing trees�, which provides the illusion that a peak ahead is sinking out of sight, before coming to the Hollyford Valley Lookout, �Pop�s View�, which provides spectacular mountain views. A short distance further on we turned onto Lower Hollyford Road to visit Hollyford Falls on the track to Lake Marian. This track crosses a swing bridge over the wild Hollyford River then leads through the forest to a boardwalk above a series of rapids and on to the small falls. The Homer Tunnel � named after Harry Homer who explored the area in 1889 � was begun in 1935 as a project for the unemployed. It took another 18 years to complete the 1219m and it is unlined and unlit with a floor sloping down toward Milford with a gradient of 1 in 10. Emerging from the tunnel we followed the winding road through Cleddau Valley and paused to visit The Chasm formed by the rushing waters of the Cleddau River. The loop walk crosses a bridge over the river where large boulders, worn smooth by the cascades, are deposited in the riverbed. Arriving at Milford at 1pm we lunched at the cafeteria before walking from the car park to the Visitor Centre where we collected our boarding passes for the 3pm cruise. The spectacular Bowen Falls, which drop 160m from the Darren Ranges, are an easy walk from the Boat Harbour. Getting sprayed with mist we scrambled down to the water�s edge through Cemetery Point � so named because of the grave-like mounds of debris washed down by the falls � from where there is the best view of Mitre Peak with it�s tree covered �footstool� in front. This 1682m mountain was called Mitre Peak because of its resemblance to a Bishop�s Mitre, and is believed to be one of the world�s highest mountains to rise out of the sea. Aboard the Milford Monarch we cruised the Sound and enjoyed the interesting commentary. Dale Point marks the northern entrance, which from the open sea is almost impossible to see. It remained unnoticed for many years. Now cruise ships from around the world enter and can travel some distance into the Sound. We saw seals basking on the rocks and passed Stirling Falls � 155m high � before being taken to the Underwater Observatory in Harrison Cove (which we were visiting as an optional extra). The Observatory was opened in December 1995 and is an educational facility with four interlinked floating pontoons attached to the rock face. There is an interpretation centre and an experienced guide who points out the various marine creatures. As well as fish we saw sponges, sea cucumbers, tubeworms, brachiopods, feather stars, tube anemones, starfish, mussels and zoanthids with bright yellow tentacles. By far the most interesting we thought was the black coral � of which there were quite a number � which, although it looks like a plant waving in the currents, is a living colony of tiny, white anemone-like animals which cover a tough black skeleton. It is rare to find black coral growing in such shallow water. We were taken back to the wharf at Milford in a small boat and arrived at 5.30pm to find the bus parking area empty, unlike when we arrived. After making a drink we returned to Te Anau, stopping again at �Pop�s View� to see the mountains in a different light, and with almost no other traffic on the road reached there by 7.30pm. This was a great day.